Editors' Picks: 20 of the Best Things to Do in Indiana! Indiana's motto is "the crossroads of America" - and so many important moments of the nation's history have taken place there. For example, Lewis and Clark set out from Fort Vincennes on their journey to explore the Northwest Territory. The first professional baseball game was played in Fort Wayne in 1871. In 1880, Wabash became the first city in the world lit by electricity when inventor Charles Brush tested his "Brush Lights," with a glow visible for a mile. Indiana is where Frank Sinatra made his debut (at the Lyric Theater in Indianapolis) and is home to the world's first theme park, "Santa Claus Land" which opened in 1946. The state is the birthplace of James Dean, David Letterman and Michael Jackson. And naturally, it's a mecca for fans of basketball. The Hoosier State has a lot going on, and here are 20 cool things to check out. 8. 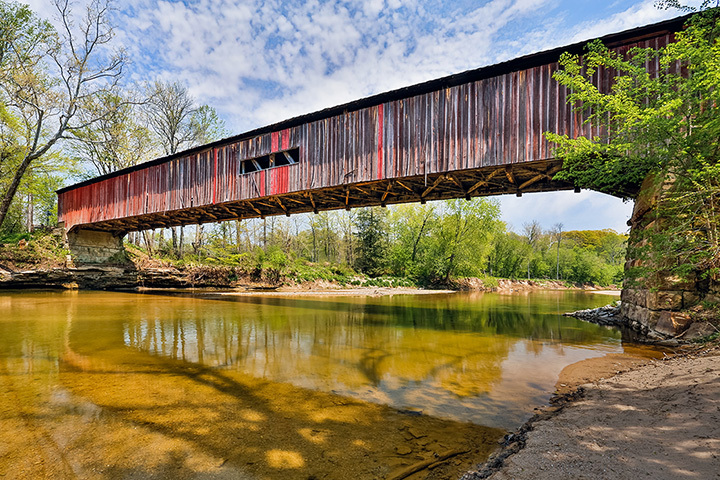 The "Spirit of Jasper"
Iowa isn't the only state with impressive covered bridges; Indiana's Parke County has 31 of them. The Covered Bridge Festival each fall celebrates these historic structures. Almost 1,000 antique dealers dot this 60-mile stretch of road east of Indianapolis. And that's somehow appropriate, considering that the National Road (old U.S. 40) dates to the early part of the 19th century. Beautiful murals based on quilt patterns can be spotted on homes, public spaces and old barns in several Indiana counties. The "trails" are a unique way to celebrate both the art of quilting, as well as the history of agriculture in the area. It regularly wins raves as one of the best museums anywhere, and not just for kids. There are five levels of interactive exhibits that will engage even the most jaded grown-up.